Bournemouth vs Crystal Palace: Bournemouth take on Crystal Palace with both sides looking to return to winning ways after dropping points last weekend. Bournemouth suffered a crushing defeat at Turf Moore as they lost 4-0 to Burnley. This proved to be a shock result, following their fantastic start to the season. Eddie Howe’s side sit in eighth after six games, with ten points. At this stage last year, Bournemouth were in the bottom three, after making a terrible start to the season. This time around they haven’t made the same mistake, which allows Howe the luxury of tinkering with his side. He will want a reaction from his side though, after such a heavy defeat last weekend. They did return to winning ways in the Carabao Cup in midweek, defeating Blackburn 3-2. Callum Wilson secured the win for the Cherries with a 94th-minute winner, which moves them safely into the fourth round. Like Bournemouth, Crystal Palace have enjoyed a solid start the new season after struggling at the start of last season. Roy Hodgson’s side have collected seven points from their opening fixtures, which leaves them in 11th. Last time out, they drew 0-0 at home to Newcastle, in a match they should have really won. Palace also secured their route into the fourth round of the Carabao Cup in midweek with a 3-0 win at West Brom. Hodgson will have been pleased to secure their status in round four, but also get one over on his former employers. Andros Townsend opened his account for the season with a brace, before Patrick van Aanholt sealed a routine win. Mike Dean is the referee for Monday night’s clash. The Englishman has officiated four top-flight matches this season, accumulating an average booking points total of 42.5. Therefore, I would advise a maximum of 60+ total points for this fixture. Both these teams are better offensively than defensively, which should make for a great game. Bournemouth have impressed me so far this year, particularly on home soil. As a result, I’m going to back them to edge this match, although it could easily end in a draw. 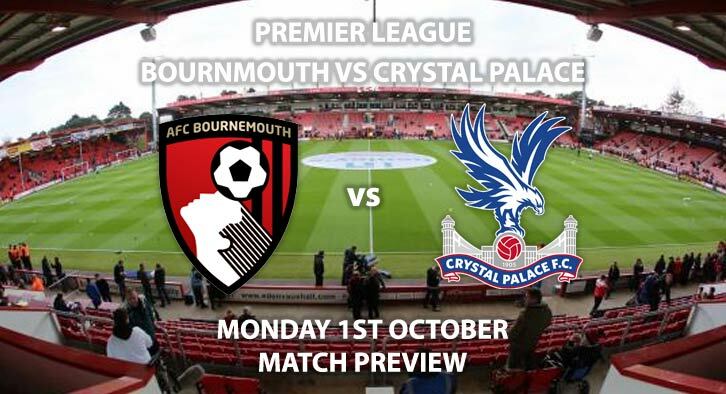 Bournemouth vs Crystal Palace will be televised live in the UK on Sky Sports Premier League with kick-off at 8PM. Correct score: Bournemouth to win 2-1 – (link no longer available). Wilson and Zaha to both score – 6/1. BTTS and FT draw – 3/1. Popular RequestABet – Bournemouth to win, BTTS, 4+ corners each team and 50+ match booking pts – 14/1. (NAP). RequestABet Specials – 80/1 and above – Wilson & Townsend to score, 3+ corners each team and Lerma & Rico to be carded – 125/1. Popular RequestABet – Zaha to score from outside the area and Bournemouth to score a penalty – 250/1. Odds and markets last updated on Monday 1st October 2018 @18:50 GMT. Remember to keep visiting the tips and preview area for further updates and betting previews around this weeks European action across the Champions and Europa League.